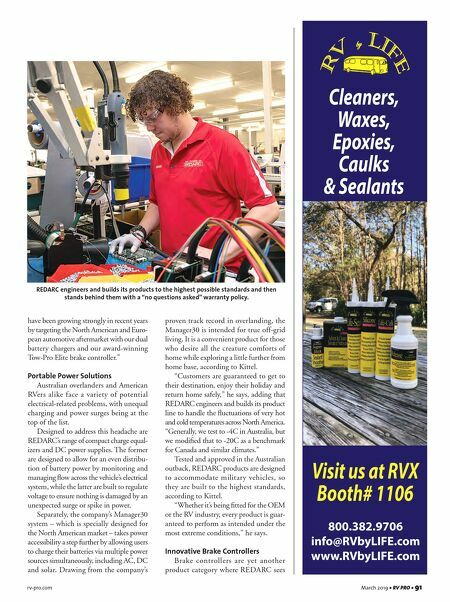 90 • RV PRO • March 2019 rv-pro.com A F T E R M A R K E T "We have such a great relationship with our customers and are always acting on their valuable feedback," says Kittel, who views suggestions as opportunities for growth. Quality & Innovation For REDARC, the proof is in the stan- dards of product innovation and quality. "You can't have a person at the top relying on what they did 10 to 15-plus years ago. I work every day to continually define and redefine why I do what I do," says Kittel, who most recently completed the Owner, President, Manager Program (OPM) at Harvard University. In a technology-driven world, Kittel says he consistently evaluates how REDARC can rely less on fossil fuels, extend the life of batteries, improve the lives of customers and do so in a socially responsible manner. As just one example of that latter, the com- pany installed a 100-kilowatt solar power plant on the roof its Lonsdale plant that's capable of generating 140 megawatt hours of energy per year. "If you forget to survey the fabric of your makeup, you'll eventually forget the why behind your actions," Kittel says. There- fore, to be an internationally renowned, award-winning power conversion spe- cialist, the company lives within a comfort zone of discomfort – because growth is not achieved amongst the content. "Our philosophy," Kittel says, "is that we want something to be different when we come into work every day – 1 percent incremental change; it's the little improvements that make big differences at the end of the year. That's innovation because now you have a major change in your business." With this mentality serving as a pillar of the company, Kittel set out to imple- ment REDARC's first five-year plan. "Around 2000, we created our first significant business plan, and as part of that plan we created an innovation arm of our business called REDARC Tech- nologies," he says. "We etched in stone an investment of 15 percent of sales back into R&D every year. That's three to four times our competitors, and it's how we innovate so rapidly." A year later, REDARC was a recipient of Australia's BRW Fast 100 Award, hon- oring the fastest-growing companies by revenue growth over a three-year period. 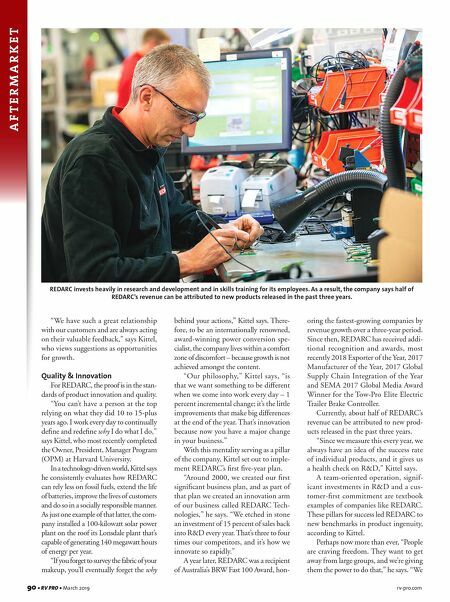 Since then, REDARC has received addi- tional recognition and awards, most recently 2018 Exporter of the Year, 2017 Manufacturer of the Year, 2017 Global Supply Chain Integration of the Year and SEMA 2017 Global Media Award Winner for the Tow-Pro Elite Electric Trailer Brake Controller. Currently, about half of REDARC's revenue can be attributed to new prod- ucts released in the past three years. "Since we measure this every year, we always have an idea of the success rate of individual products, and it gives us a health check on R&D," Kittel says. A team-oriented operation, signif- icant investments in R&D and a cus- tomer-first commitment are textbook examples of companies like REDARC. These pillars for success led REDARC to new benchmarks in product ingenuity, according to Kittel. Perhaps now more than ever, "People are craving freedom. They want to get away from large groups, and we're giving them the power to do that," he says. "We REDARC invests heavily in research and development and in skills training for its employees. As a result, the company says half of REDARC's revenue can be attributed to new products released in the past three years.